Previous version Top Eleven 5.11 apk for Android will help you to downgrade or install older app easily. This is one of the best Sports apps. You will be guided by Mourinho to become qualified coaches. You will be competing against other players in a league. Starting from the bottom league, gradually you try to go up a division to the leagues on it. Certainly not an easy task, because other players also want the same thing (and they are also guided by Mourinho). Key major progress in the game is actually consistency. Matches are held every day at certain hours in real-time. 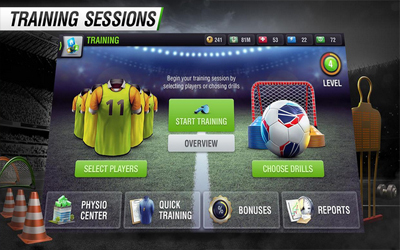 Therefore, you have to train, organize, and condition the team on a regular basis every day, like a game Football Saga 2 made by Agate Studio. Top Eleven has been released since 2010 and every year get updates. For six years running, there were more than 130 million managers who have played this game on the iOS platform, Android, and Facebook. Added a new challenge featuring Mourinho. Get ready to defeat him and compete for tokens! Added a confirmation step when refreshing the scout list. Awesome, really enjoyable, team and player progression really works and i love the transfer system, great little game that doesn’t require much effort and skill.